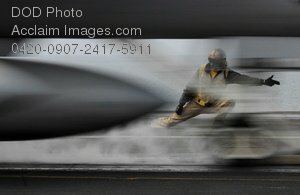 Description: Free, public domain image: Flight Crew Member Distorted by Jet Launching. Persian Gulf (January 10, 2008) An F/A-18 Hornet launches off the flight deck of the Nimitz-class aircraft carrier USS Harry S. Truman (CVN 75). Truman, and embarked Carrier Air Wing (CVW) 3, are deployed in support of operations Iraqi Freedom and Enduring Freedom and maritime security operations. U.S. Navy photo by Mass Communication Specialist 3rd Class Ricardo J. Reyes (Released.